I don’t drink soda that much anymore, outside of mixing Sprite with Crown Royal Black. But I do notice when any soda brand replaces high fructose corn syrup with real sugar. Such is the case with the recent Pepsi 20 oz bottles that have done away with the HFCS and used real sugar. I found the Vanilla Pepsi recently at the 7-Eleven. Admitting this right up front: I prefer Coke over Pepsi pretty much anytime, but I am a sucker for vanilla flavored colas, as evidenced by my review of a Cherry Vanilla Pepsi over 4 years ago. I reduced drinking soda many years ago due to health reasons, even though I still love soda and have since I was a little kid. But now, the rare solo soda treat is something I do enjoy. 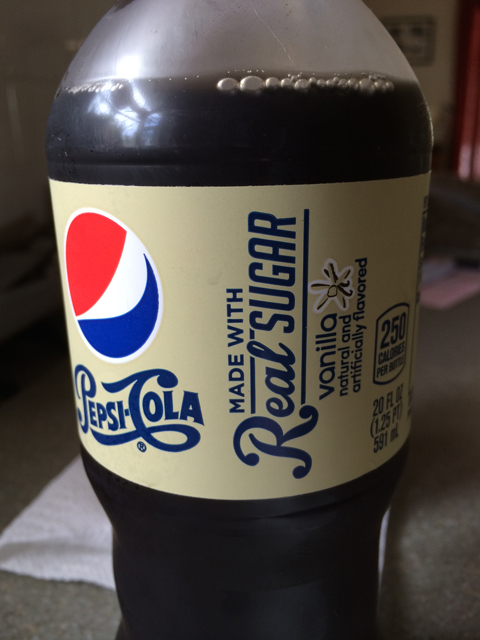 Upon the first sip of this Pepsi Vanilla flavor, I did notice right away that it wasn’t as sweet as the last time I tried a vanilla-flavored Pepsi. I attribute that to the use of real sugar. Trust me, there is difference. HFCS tends to be a good deal sweeter, as well as leaving a slight aftertaste that lingers longer than it should. This was refreshing and makes me wonder why more sodas don’t permanently get rid of the HFCS and use sugar. I know one of the reasons is cost, as I’m sure it’s a lot less to use HFCS, which doesn’t break down in our bodies as well as sugar does. Taste wise, the vanilla wasn’t overpowering at all. Each sip and gulp I took was very good. It’s too bad they make these sugar sodas a limited run. Maybe if enough people stop drinking the HFCS sodas, they will change. And based on some articles I’ve seen recently, soda consumption has gone down. This is a good sign as more than 90% of all soda is made with HFCS. Anyone try this latest Pepsi flavor? How about other flavored sodas? There is definitely a difference with real sugar and I LOVE that Pepsi has been reintroducing all these real sugar sodas. I’m trying not to drink as much soda but it’s hard to say no to these. I’ll have to find this one soon. Yeah, I figure if it’s a limited edition, I can splurge on a soda with real sugar. I’m on team Coca Cola myself so I only stray to Pepsi if that’s the only choice. And these days I stick with diet. Actually I’ve been drinking diet for so long that if I drink a regular is feels like I’m drinking syrup. I sure wish Coca Cola would venture into the real sugar arena. I certainly wouldn’t be opposed to making a soda purchase.